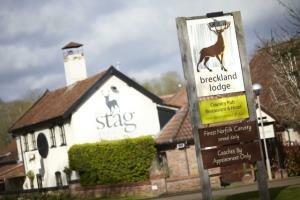 Breckland Lodge01953 455202work HotelA place to meet, dine and stay. As an independent business in the heart of East Anglia, we have gained an enviable reputation with customers paying for a relaxed, friendly service providing good value, quality food and accommodation. With 33 recently refurbished en-suite hotel rooms featuring flat screen TV's, free Wi-Fi access, radio, telephone, toiletries, hairdryer and tea and coffee making facilities in our standard rooms and air conditioning, iPod docking stations within our premier rooms, the hotel provides value and the ultimate in comfort. Whether you choose to eat in 'the Stag', our Norfolk country pub offering all day food and bar snacks, or try our extensive restaurant menu and carvery, there is something to suit every budget. Our good value breakfast, using locally sourced ingredients where possible continues to grow in reputation. Come and visit our coffee lounge, an extension to our reputable restaurant, offering a relaxed and stylish environment to enjoy a range of coffees, teas and freshly made cakes, pastries and light lunches or evening nibbles. Whether your stay is for business or pleasure we pride ourselves on our attention to detail, our friendly staff will make your visit a relaxed and enjoyable experience. A place to meet, dine and stay.